Body art is really fashionable for weddings right now. 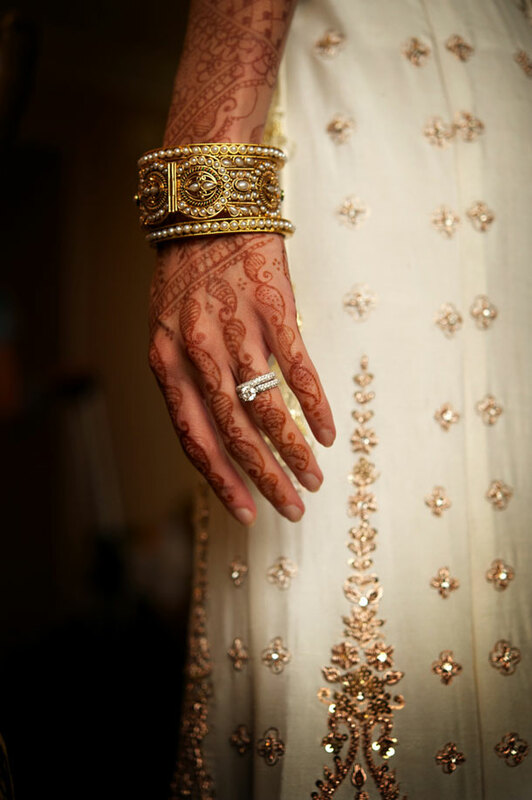 Indian weddings have sported henna tattoos on hands and feet for centuries (it’s beautiful) so why shouldn’t a girl try something different for her wedding? Henna tattoos actually hail back to the traditions not only of India, but of Morocco, North Africa and the Middle East. These days though, there is an added contemporary flavour and artists add their own unique elements. Anything goes. Have a Google search and you will be able to play with any number of different designs. What’s great about this modern trend is that they’re both temporary and can be customised – you can probably design something to closely match your wedding dress colour, mood, theme or any other element of your wedding that you want the body art to reflect. Applying henna to the body is traditionally known as the art of mehndi (derived from the Sanskrit word mendhika) – fairly elaborate designs that last from a few days to a few weeks, done mainly on the hands and feet but they are also applied anywhere else on the body. Henna is the western word for mehndi. Traditionally these designs are representations of the sun on the palm of the hands or feet and revolve around the idea of ‘awakening an inner light’. It is not only henna art that is available. Body painting is an option too. A little more versatile than henna, which is essentially a red-brown colour (anything else – black in particular – and dyes have been added, so you might want to be cautious), body painting can use any colour. Many regard body painting as an art form – although there is a bit of a debate around this issue. You may have to advertise for a body paint artist, as I’m not sure how popular they are. Otherwise, consider buying body paint and then contact a design school for a student who wants to use you to practice on (you can as to see their portfolio). Body paints are usually water-based and supposed to be made according to rather stringent guidelines, making them non-toxic and non-allergenic. There are yet other body paints that are glycerin-based and semi-permanent, which means they shouldn’t rub off as quickly. Some artists use temporary tattoo ink or something called body glue, specifically formulated for freehand work.